I haven't seen the drawings you are referring to, so I misunderstood your question. I'm sorry about that. Dang it, now I'm confused also. We are probably both overthinking this. Once your boat is upright again and you start laying out the pieces of wood that guide the tape all the confusion will go away and it will make sense. It is one of those processes that is hard to describe in writing, but is easy to do in person. OK, I took the easy way out and taped a line at the waterline using a laser level. The big reason is I didn't have enough room to extend the V shaped pieces wide enough in my shop. We'll get that step done when she's on the trailer. I flipped the hull (getting easy now!) and painted the sides and then below the waterline. The hull is a nice grey. Super happy with the color. FWIW, I wanted to use a 2 part poly due to it's fuel resistance. I wound up using Interlux Perfection. On the bottom I used VC-17 (freshwater paint) over a 2000E epoxy coating. Tonight I start putting fittings on permanently. Yay! Lookin' super! Let's go sailing! vc17 is the way to go in fresh water. the progress looks great. Shes coming out Saturday morning. .... it's all lined up. She's painted (pics soon) and a new basement door is waiting to be put in. Sawzall and Vaseline might be required! YAY!!! Hope ya don't need the Sawzall! I heard of a guy once who actually built a boat in his living room and had to cut a hole in his wall to get it out. Well it didn't happen. I got a nasty cold that had me horizontal for four days and then we got over a foot of snow Thursday night. So I postponed the extraction until the Sunday after Thanksgiving. I'm still not 100% so we will wait. Since the soonest I could launch is mid April or later we aren't going to rush it. Best wishes, whenever that extraction may be. And here is the solutions! Congratulations Steve. It is great to see her outside at last. What people do not understand is that if you have what it takes to get this far you surely have what it takes to get the boat out. At the beginning, it reminded me a little of that old British song from the 60's, just kidding but it is fun. When I first saw the CS20.3 3D drawing I was smitten. But I knew that building it outside wasn't a possibility and my shop door was only 47". I scaled the early drawings and determined that the height dimension was possibly less than 48". I drove to Tennessee on the way to Florida to measure Doug Cameron's boat and sure enough, as best as I could measure it was about 46.5" without the shoe keel. I figured if need be I could get my Sawzall. But upon returning home I all of the sudden realized I had that support beam, so again, I made a sort of profile template and laid it on it's side and figured the sewer pipe might need to be removed. Later in the build while I had her upside down I just went ahead and through caution to the wind and glued the keel on. That put her over the edge. When we shoved it through the shop door, there was less than 1/2" in the 48" rough opening. I'd removed the doors and frame ahead of time. We may have not needed to move that support beam, but my nephew Patrick, who builds timber frame homes for a living, just decided that nudging it out of the way was easy enough. All in all, it was out in about two hours. The best part was all the folks who came over since she was 3D and tried to convince me there was no way it was coming out. I'd read that Craftsmanship and stubbornness are the same thing and I don't think that is far off. She was coming out one way or another. I have a bit of shop cleanup, drywall repair (oops), but she's out! I now have room to build the masts and sprits and rub-rails. Everything else is done. I may glue the tabernacles in tonight. She looks way bigger out of the shop and I forgot how convenient having her sitting on the keel blocked up in the shop was. She's a lot taller on the trailer. And here I was afraid that you'd have to jack the house up to get it out. Impressive work. Enjoyed the videos, congratulations Steve. Take a day off and celebrate. Funny you mention that Amos. I played football (delayed Thanksgiving turkey bowl) in the snow Saturday with a bunch of relatives and then this all happened Sunday. I was in bed by 8 o clock Monday night and slept right through until 7am this morning. But I'm rested and ready to clean the shop tonight and probably do some gluing. Congratulations. I watched the video twice and still not sure how it all happened. But it did! She is a beauty !!!! After the extraction I got her up in the garage. And then I spent the last two weeks knocking off the honey do list, and finishing the new basement door, the shop door, a bit of drywall damage and then I cleaned all the epoxy drips, painted the shop floor and celebrated how much space there is WITHOUT A 20' BOAT IN THERE! Anyway, I'm going to start building the sprits and masts. But when I was looking at the boat in the light, I am disappointed in the surface of the sheer strakes. Amos said a the messabout that painting was "humbling". I totally agree. 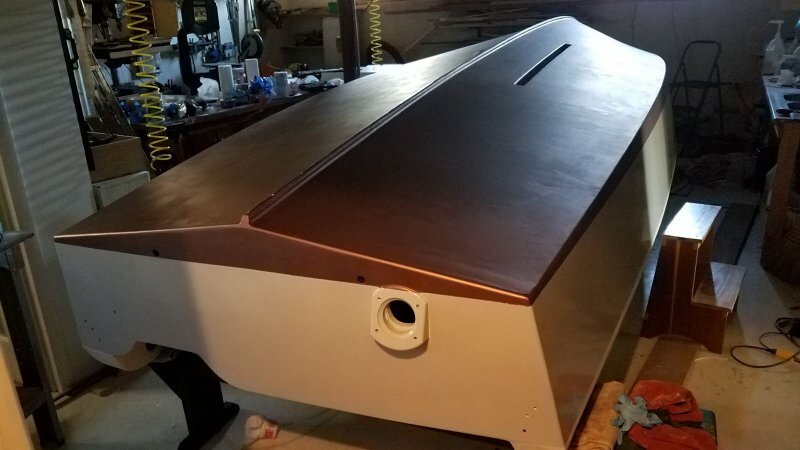 The boat overall looks great, but I draped cloth over the cabin top, and cut it nice and even about an inch down from the top at the green stage. On the hull I carried the glass about an inch above the joint and trimmed the same way. On the cockpit, I draped clot over the top to strengthen the joints. I faired in the edge and sanded it good and smooth, but it still looks not so good. Maybe I'm being a perfectionist, but it's bugging me. I'm not one to normally "let perfection be the enemy of good" but this stretch of the boat bugs me. The part that most bugs me is I don't know how to fix it. I am thinking maybe a bunch more high build primer and then a flexible long board, but maybe there is a tip you all can give me. I have all winter and the good news is I can push the boat outside (trailer is really awesome) to sand if necessary. Aggressively sanding when it is 25 outside will keep you warm.